All the moonies have been waiting anxiously for September 6th so they could watch episode 5 of Sailor Moon Crystal. VIZ Media hosted an online Sailor Moon slumber party via Skype. As usual (in my opinion) the episode started out rather bland, as in, the characters really just don’t have any facial expressions. Makoto is the first character we focus on in the episode and then we see her act of heroism when she saves Usagi from an accident. Makoto then dashes off in a mysterious, Tuxedo Mask manner. You would think at five episodes in, Toei Animation would figure out that viewers want to see more expression in the characters. I understand this isn’t the original series and Crystal is following the manga more closely; however, even Naoko drew the characters with a wider range of expressions. I didn’t begin to fall in love with this episode until the lunchtime scene where Usagi’s buns creep across the length of the bench where Makoto is sitting and eating her bento. Here, it was the voice acting that made the scene so memorable. Quite frankly, I was expecting Usagi to snake over the bench with wide eyes and a huge grin, but all we saw was the same three facial movements that we will probably see throughout the entire series. Do you suppose they created an image bank for each of the characters where they can just reuse the same facial expression over and over? If it wasn’t for Usagi’s excited shouting and genuine thrill at seeing Makoto’s bento, I wouldn’t have believed this scene was supposed to be one of spontaneous emotion. Thankfully, the voice acting for Usagi was great and I was able to get excited just from what I was hearing. Makoto’s voice worked here, too, but otherwise I found her character to be very flat and emotionless – even in battle. I just didn’t feel any energy or anger behind Makoto’s voice. There are definitely some scenes that are drawn beautifully in Act 5. The dream segments are just as wonderful as in the original series and in the manga. Just like Usagi, I actually had a hard time differentiating between dream and reality when Tuxedo Mask appeared at her window. The rest is pretty self-explanatory if you’re familiar with the series. 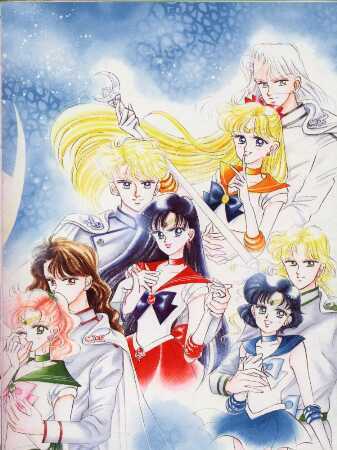 Usagi, Rei, and Ami find Makoto in danger and they transform to fight the Youma which turn out to be powered by Nephrite. 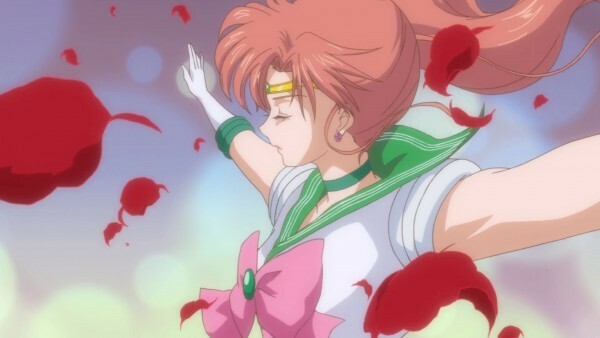 Makoto isn’t taken down even in civilian form and Luna realizes they have found Sailor Jupiter. The scene felt very rushed, although I enjoyed Nephrite’s comment “I have seen that face before,” when he sees the angry glare for Jupiter. It reminded me of the earlier comment from Jadeite when he sees Sailor Mars lying on the ground, “she is beautiful.” The references to the drawing of the senshi with the Four Kings of Heaven. These references are also true to the manga where each of the Four Kings at least express a sense of attraction towards the senshi. I would really like to see Toei Animation run with this idea, but I know it wont happen. I am happy to say that the transformation scenes did not drag out in Act 5 as they have in the past. I will admit that I have been tempted to skip past the transformations simply because the CGI is bad and they’re just not pretty enough to justify their lengthiness. I will continue to hope that the quality of this series improves because I really want to have a positive experience to reflect upon when the option to purchase DVDs/Blu Ray arises. Do you think we would praise this series if we didn’t hold it to the standards of the first one? Or would the quality still feel rushed and sub-par? These are the things every moonie has to be asking themselves. **As always, I have been watching Sailor Moon Crystal on Crunchyroll because I prefer Crunchyroll.